Demonstrators have taken to the streets across the US for a second day to vent their anger over Donald Trump’s presidential election victory. Professional protesters, incited by the media, are protesting. Very unfair! They fear the billionaire businessman’s political triumph will deal a blow to civil rights. 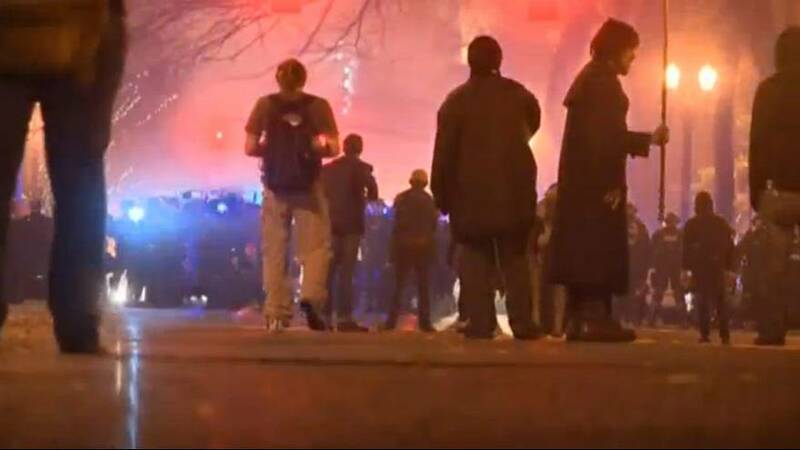 In the northwestern state of Oregon police said they detained 26 people as a protest turned violent in Portland. Demonstrators broke the windows of local businesses, lit firecrackers and started a fire in what police declared a riot. It happened as several thousand people took to the streets in the city. Police said many in the crowd tried in vain to get anarchist groups to stop destroying property. While in Washington, protesters – mainly young people – took to a megaphone to voice their concerns. “There’s a lot more of us than there are of them. Hillary won the popular vote, love does Trump hate. We need to continue this fight you guys, please,” said one demonstrator. Thursday’s demonstrations were generally smaller in scale and less intense than those the day before. But protesters are not giving up, with more anti-Trump action planned for the weekend. The president-elect himself described the demonstrators in a tweet as professional protesters incited by the media. In the morning Trump’s tone had changed to something more conciliatory, although the original tweet remained in place. Many opponents of the next president fear America’s values and cohesion are under threat. Donald Trump’s campaign was riddled with insults and claims that were exposed as lies. But the millions who voted for him either didn’t care or had other deep-rooted reasons – and he won the race to the White House under the US democratic system. Trump lost the popular vote narrowly to Hillary Clinton but won an absolute majority of electoral college votes. Who'll be in Trump's Cabinet?